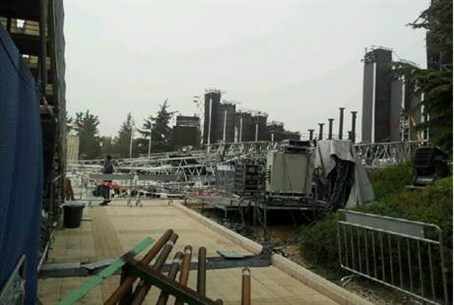 Hila Bezaleli, a 20-year-old female IDF officer, was killed Wednesday when a lighting pole collapsed on stage during rehearsals for next week's Independence Day celebrations on Mount Herzl. MDA paramedics responded to the scene and attempted to resuscitate the officer to no avail. At least 7 others soldiers - and as many as 10 civilians - were injured as well, according to the latest reports. The wounded were immediately rushed to Shaare Zedek Hospital. Most of the injured sustained light to moderate injuries, but one was said to remain in critical condition while another was in serious but stable condition. Six emergency crews were called to the scene and began searching for trapped victims, but at this time no more victims have been found. MDA spokesman Tzvika Gronich said, "Multiple units were immediately dispatched. Paramedics tried to resuscitate a woman in her twenties for some time, but she was pronounced dead at the scene." "The incident ended with eight moderate to severe injuries, and several light injuries," he added. MDA workers Tzvi David said, "I arrived and immediately saw at least three seriously injured people. I started to resuscitate one individual, but sadly she did not survive.. We also tended to two other seriously injured people who were in critical condition." Witnesses say that the lighting post collapsed after swaying in high winds. The Fire Department and Israel Police reported an investigation is underway. Initial findings indicate a torn cable broke free causing the lighting fixtures to collapse while dragging a concrete cube weighing several tons behind it.